A year or so ago, I was in a hurry to frame a picture I was going to be giving as a gift, and rather than drive down to Midway and Rosecrans to either Michael’s or Aaron Bros. 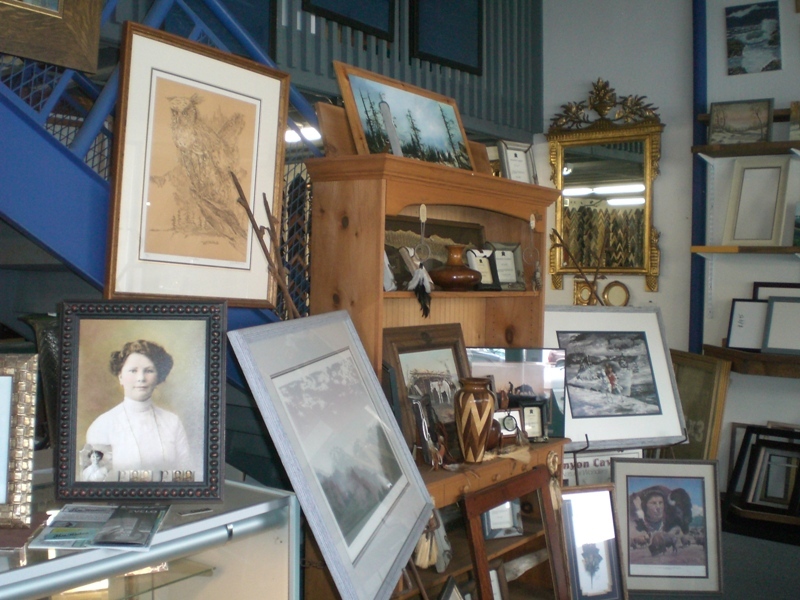 I decided to stop in at John Bakers Picture Frames on Point Loma Avenue. I am embarrassed to say that in the 36+ years I have lived around the corner, I had never been in the store. I was amazed at the selection he offered his customers. Perhaps one of the things I liked the best was that “Murph” – his dog – greeted me at the door. The next time I went in the shop I had some doggie biscuits with me, only to find that Murph had gone on to another place. And I found out that John had retired and the business had been purchased by an employee of his of over 14 years. Let me introduce you to Mary Maslanik. I watched Mary work with a customer today while I waited for Chris Baker to complete a picture frame for me. (Yes, Chris is John’s son.) Mary worked with this woman – for almost an hour. The scene reminded me of a woman trying on shoes and not finding anything that she liked. Mary brought out all kinds of samples of matting, frames, etc. until there did not seem to be anything left in the front or back room. When I asked her about it later she answered that “working with the memories of her customers is a rewarding business. People want to tell her about the meaning behind the picture; where it came from; history, etc. It acts to preserve mementos for many generations.” I would have lost my patience in talking to Mrs. E., but Mary didn’t seem to mind, and laughed with her many times. Chris Baker working on Widder Curry’s framing. When she was 30 – I didn’t ask how old she is now – she moved to Ocean Beach to the Cliff View apartments on Pt. Loma Avenue. One day, over a cup of coffee at the coffee shop near the store, she met John Baker. She asked him if he needed any help and he asked her if she could handle a 40” x 60” pane of glass. When she said “yes” he took her down to the shop and watched while she hoisted the glass he was speaking about. She was wearing a dress and he told her if she wanted the job she could not wear a dress, and, for 14 years after that first meeting, Mary continued to work with John. It has not been easy for Mary. Last year she had a heart attack and almost died. The doctors are still trying to regulate hormones so that it doesn’t happen again, and it is a challenge. Suffice it to say that she thinks that being on birth control medication for too long is what triggered the problem. She said that one of the most exciting experiences she has had was when someone brought an original newspaper when President Lincoln was assassinated to be framed. The thrill of reading the original account and the excitement of feeling the paper was exhilarating. 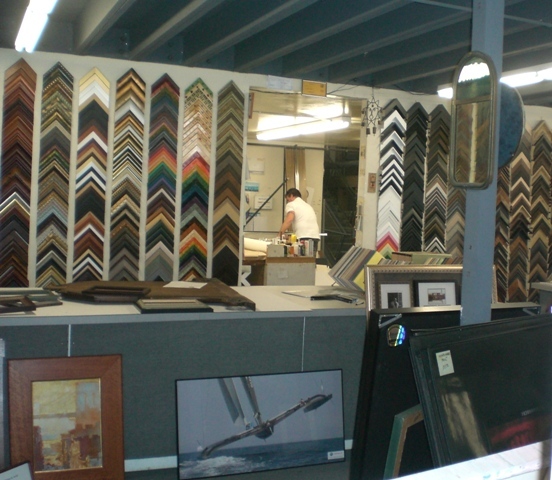 And I want to point out that she does all kinds of framing – not just custom framing. I took two pictures of some orchids I am growing and liked them so well I wanted to frame them. I took the two 8”x10” pictures to her and picked out the wooden frames I wanted. While I waited, Chris framed them; put glass in both; covered the back with paper; and added the hanging wire. The total cost? $29! And it is a professional job. One may save a few bucks going to the other two places, but the service, the integrity and the personal concern will keep me at John Baker’s as long as Mary Maslanik is there. Not to be a mensch or anything, but it was the former owner who was one of the biggest thorns in the side of the VFW post that tried to relocate just a few doors down. From what I understand, he was not at all pleasant when it came to dealing the the vets. Glad it’s under new ownership. That may be the case but should we see it as someone who heartlessly disrespects veterans or as the average business owner whose customers will no longer have a place to park and may not appreciate the above average rumble and commotion going on? I agree it was sad to see the VFW not only have to move but be rejected from prospective new digs, but let’s not pretend that NIMBYism isn’t a very common and perfectly natural reaction to what would be a large interruption in anyone’s established environment. If I’m wrong and there was obvious sneering hate going on then let me know but just strongly opposing such an establishment isn’t so uncommon or unjustified. That’s right. I forgot we were on opposite sides of this issue! Mary’s nice – take something in to be framed. You’ll be pleasantly surprised. John Baker was a paratrooper in the 101st airborne during Vietnam…. he is a Veteran. He lost his entire Platoon in combat. The problem with the hall moving onto Point Loma Ave….. was the locally known drug dealers who showed up along with the Veterans. It wasn’t the Veterans by any means…… it was the bad elements they brought with them. I don’t know the history of John Baker’s opposition to the VFW’s move, but, years ago he told me about when he was sent as a young soldier to Mississippi when Federal troops were sent to Oxford to restore order there. Maybe that experience contributed to the opposition. I do know how he credited a local, now National, hamburger corporation with the loss of his eye, but lost his case because he hadn’t saved the evidence in his fridge. I saw how he dealt with a young retarded man who brought him a poster to be framed at the store on Midway at Fordham. He treated the young man with respect. The poster was beautiful and paid for in full, with no discounts on account of his “disability”. John Baker’s does beautiful work, period. I only wish the store hadn’t moved out of the main business area where I do business. I have to clarify Mary’s comment. I served with the 101st Airborne from June 1960 to December 13, 1963. I was honorably discharged and I left Fort Campbell KY on that date. My last year of service was as a Sgt. E-5 , A Recondo, a forward observer for 81 mm. mortars, and a squad leader with the weapons platoon. My company received their orders to deploy to Vietnam on the very same day I cleared base. I did not find out about that until a few years later when a buddy told me about it. My platoon did take heavy casualties, but I was not there. I’m a cold war veteran, I am not a combat veteran. As far as my opposition to the VFW post on Point Loma Avenue, I just did not feel that having a bar there would be of any benefit to the street and the nearby school. Selling my business to Mary was probably one of the smartest things I have done in years. 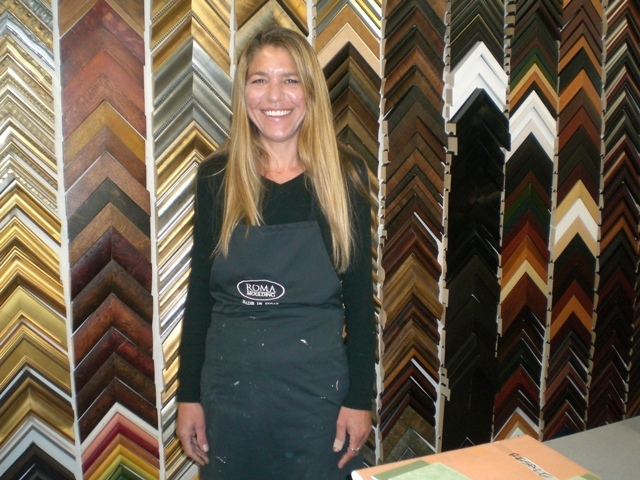 She is a more than dedicated picture framer, she loves the craft and has mastered it. It was a great delight to me when she brought in my son, Chris. Chris has been framing since he was seventeen. Between the two of them, they have close to fifty years experience. The place is busy, really busy now. I guess I can attribute that to their enthusiasm about the place. When I stop by to visit, I feel like I should get back to work and help, but then I come to my senses and just get out of their way.